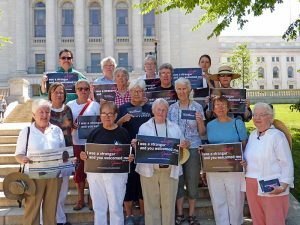 Sinsinawa Dominican Sisters Ruth Poochigian, Sheila Fitzgerald, Maureen McDonnell, Joan Duerst, Mary Ellen O’Grady, Mary Rathert, Pat Leahy, Miriam Brown, Mary Ann Nelson, and Isabel Rafferty along with Presentation Sister Joy Peterson and others gather on the capitol steps in Madison for the prayer service. Ten communities of Midwest Catholic Sisters are calling on citizens, President Barack Obama, and federal, state, and local politicians to work together to welcome refugees and are launching a public awareness campaign to make sure potential candidates and voters remember this critical issue when they head to the polls in November. The United Nations declared June 20 World Refugee Day. In observance of this, a Madison prayer service was held at the Capitol, and a Dubuque prayer service was held on the corner of JFK and Pennsylvania. The public was invited to join Catholic Sisters in praying for refugees and for political leaders. Sisters are also urged communities to welcome refugees by placing billboards in Kieler and Madison, Wisconsin; the Quad Cities, Des Moines, Dubuque, and Clinton, Iowa; and Omaha, Nebraska. Postcards also are being sent to federal, state, and local government officials nationwide. Sinsinawa Dominican Sisters Virginia Geniesse, Sharon Casey, Patty Caraher, Quincy Howard, and others gather in Dubuque for the prayer service. 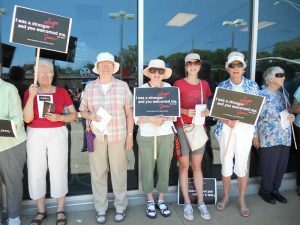 The following ten congregations of Catholic Sisters are coordinating this public awareness campaign: the Dominican Sisters, Sinsinawa, Wis.; Sisters of Charity of the Blessed Virgin Mary, Dubuque, Ia. ; Sisters of the Presentation, Dubuque, Ia. ; Sisters of St. Francis, Dubuque, Ia. ; Sisters of the Visitation, Dubuque, Ia. ; Congregation of the Humility of Mary, Davenport, Ia. ; Sisters of St. Francis, Clinton, Ia. ; Sisters of St. Benedict, Rock Island, Ill.; Franciscan Sisters of Perpetual Adoration, La Crosse, Wis.; Sisters of Mercy, West Midwest Community, Omaha, Neb. For more information, visit www.facebook.com/catholicsisters.